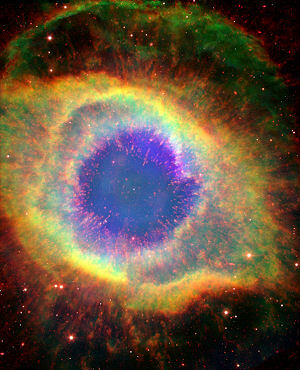 While the Helix nebula is not the only stellar object to have a complex form (e.g. the mysterious filaments in the supernova remnant M1 or the Rings of Supernova 1987A) it certainly harbors it's share of mysteries. 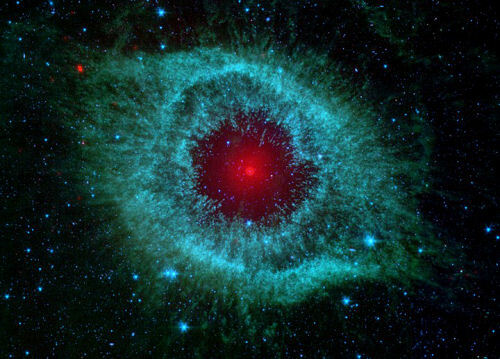 The Cambridge University Press noted this in a report presented on the cloudy modeling of the central zone of the Helix Nebula entitled "CLOUDY modeling of weird Far-IR emission in the central zone of the Helix Nebula". 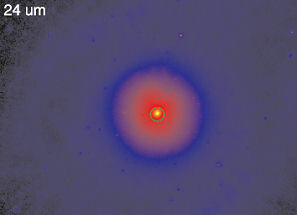 "We were surprised to see so much dust around this star," said Dr. Kate Su of the University of Arizona, Tucson, lead author of a paper on the results appearing in the March 1 issue of Astrophysical Journal Letters. "The dust must be coming from comets that survived the death of their sun." 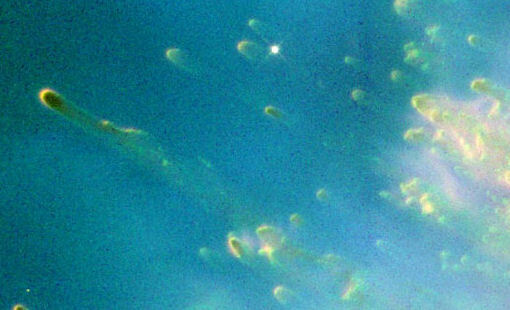 Cometary knots with the mass of our Earth and the size of our solar system! 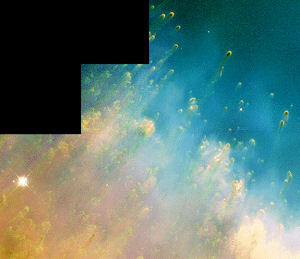 Pictured above is a close-up section from the original image located at the APOD website. Image: Original at APOD Website. Striking Features - Very Striking Indeed! What caused so much excitement in the science community regarding the "comet-like knots" was the fact that they have never seen so many in a single nebula prior to the above photo. 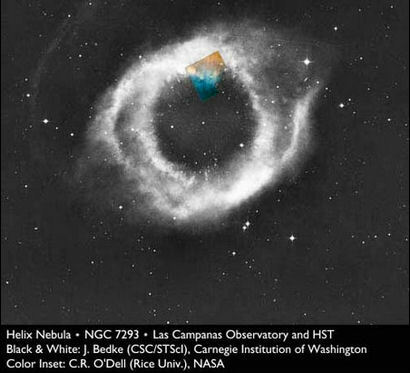 Though many of the features found in the nebula were known, having previously been resolved through the use of ground-based telescopes, it wasn't until the Hubble was pointed at the Helix that the detail and sheer amount (thousands) were revealed. 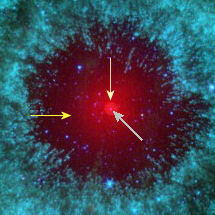 Seen below is a ground-based image showing the area of the nebula where the smaller Hubble image (above) was taken. Some years ago I was researching astrophoto composite work on my own and the Helix just happen to be one of the objects I had decided to work with. Above are a few frames from that project. 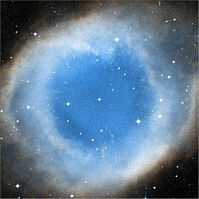 Above is the Science and Engineering Research Council Survey/Space Telescope Science Institute (SERC/STScI) image of the Helix Nebula in the Infrared. See it? The arrow indicates the central star with the circle roughly encompassing the boundry of the nebula's outer ring and north/south outer plumes. 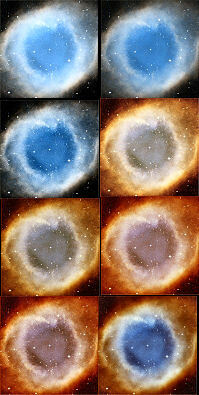 The composite images (above and below) are in RGB created from AAO/R/DSS2 (Red) SERC/J/DSS1 (Blue) with Green averaged. Since the resulting image was none too spectacular (see below) it was sent through a series of enhancements with the last image being the results. 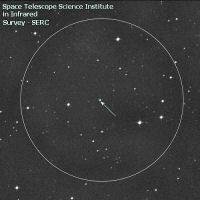 Above is the final image. Not as sharp or as great as recent photo images of the Helix, nonetheless, a fairly decent effort to date.